How were they formed in NZ? About 250,000 years ago, in the Rotorua/Taupo area, intense volcanic activity generated huge ash showers which were washed and eroded into lakes forming sediment beds up to 80 metres deep. Subsequent sub-surface thermal activity forced hot water (120 C) up through these beds transforming the clays into soft rocks with ordered internal structural sequences which are now called zeolites. Also at that time severe block faulting drained the lakes exposing many deposits. Subsequent ash showers covered some of the deposits to depths of 30 meters. There are about 40 different zeolite types and their occurrence depends on conditions during formation. 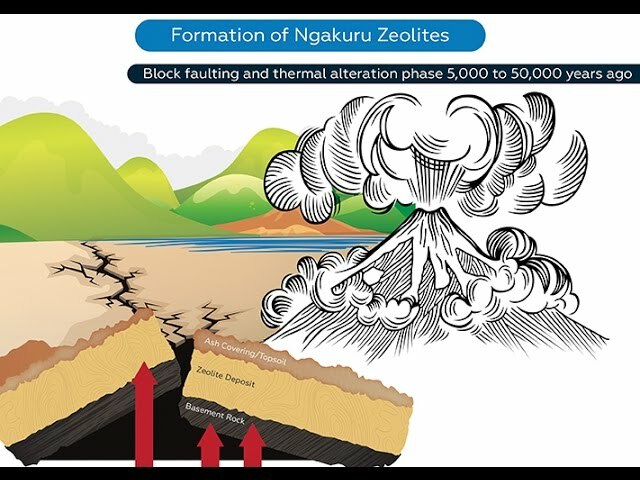 The Ngakuru zeolites located in the Taupo Volcanic Zone of the Central North Island of New Zealand are predominantly mordenite and clinoptilolite. The location, duration and intensity of the thermal water flows during formation determines the degree of thermal alteration. Deposits close to thermal fissures are fully altered and often mechanically strong whilst those further away are often poorly altered and can breakdown into constituent clays. During the thermal alteration phase amorphous material was washed from the clays leaving a 3D skeleton of aluminium and silica oxides which due to a unique configuration have a high negative charge (cation exchange capacity, typically greater than 100 meq/100g). Positively charged cations in solution (or molecules suspended in air) can be absorbed onto the latticework and depending on pH, cation concentration and charge characteristics can later be released. This combined honeycomb framework and net negative charge, allows Zeolite to both absorb liquids and adsorb compounds. Zeolite works both like a sponge and a magnet; soaking up liquids and exchanging magnetic compounds, making it suitable for a variety of purposes from eliminating odour to cleaning up oil spills to reducing nitrogen and phosphorus leachate on farms. Blue Pacific Minerals Limited has two quarries with total surveyed deposits exceeding 10 million tonnes. Zeolite from each of the quarries is unique. One quarry contains zeolite that absorbs odour and liquids extremely efficiently and is therefore used as pet litter, as a granular oil/chemical absorbent and as an odour absorbent for composts etc. Another quarry contains zeolite that has a high cation exchange capacity, absorbs liquids but is very resilient to mechanical breakdown. This product is excellent for absorbing cations from wastewater and as a base for slow release fertilisers. Zeolite is also recommended by the New Zealand Sports Institute as a suitable additive for sand-based sports turf areas, in particular golf and bowling greens.